Our event last year was so much fun that we’ve decided to do it again! Formula Honda invites you to be our guest at our second annual Ladies Night Out networking and social event on Monday, March 6th, 2017. We invite you to have a little wine and food, while you enjoy a fun, social, inspiring, motivating and networking evening celebrating successful women in our community! All proceeds and donations will go to support the Scarborough Hospital Foundation Birchmount Campus. The night will be filled with empowered women, ideas, and amazing chats. And of course, admission is free! Thank you to all of our sponsors and vendors who attended last year’s event! We had a great turnout, and expect to see many of the same faces this year. We are very proud to announce that out Ladies Night Out event was a success. 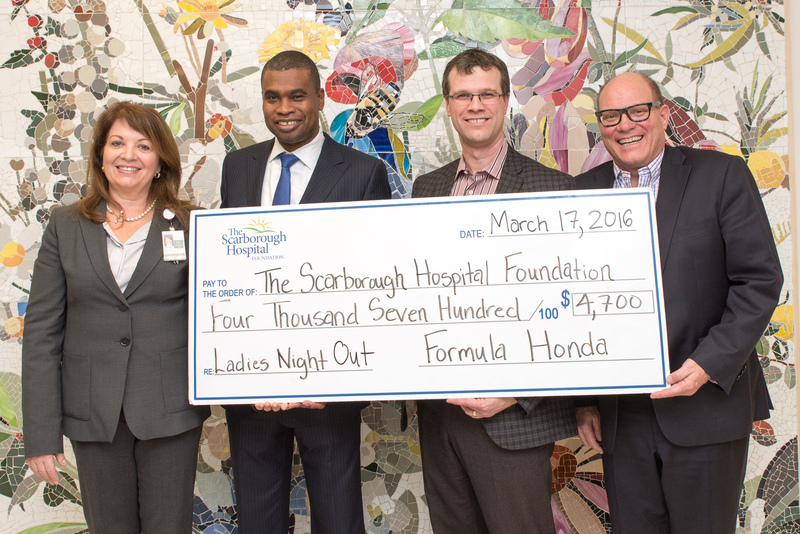 On March 17, 2016, our General Manager Nial Boatswain dropped off a cheque for $4,700 to The Scarborough Hospital Foundation Birchmount Campus! Thank you to everyone who made this possible!